THE BIGGEST DIWALI FEST OF THE YEAR 2017!! Get ready for full masti and diwali festival!! 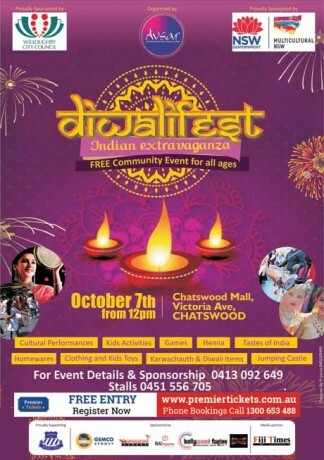 Come celebrate the festive season with us at the DiwaliFEST in Chatswood on 7th October. FREE invitation to everyone to get together with family and friends to participate in the DiwaliFEST 2017. AVSAR, a not for profit organisation, based in North Shore aims to educate and develop an appreciation of Indian culture in the younger generation in the areas of languages, classical dance, music etc. All the income from DiwaliFEST and any sponsorship is being utilised to organise FREE KIDS WORKSHOP at Local Schools. At this FREE Family friendly community event, we promise you a fun filled day with various Indian folk performances, food stalls, Heena, Jumping Castle, Kids Activities, Facepainting, Kids Toys, Games, Handicraft, Clothing, Accessories, Exciting Prizes to be won, art&craft handmade by local school kids and lots more…..
From Karvachauth to Diwali, all your festive needs can be fulfilled at this year’s DiwaliFEST in Chatswood on 7th October. Come and support your community and be part of AVSAR this Diwali !! Premier Tickets Australia is proud to be the online ticketing partner for DiwaliFEST @ Chatswood on 7th October 2017.